1Pharmacognosy and Ethnopharmacology Division, CSIR-National Botanical Research Institute, Lucknow, Uttar Pradesh, INDIA. 2School of Pharmacy, Babu Banarsi Das University, Faizabad Road, Lucknow, Uttar Pradesh, INDIA. Objectives: A high-performance thin layer chromatography (HPTLC) method for the simultaneous quantitative determination of caffeic acid and quercetin in methanolic fraction of Bauhinia tomentosa L. floral buds was developed for the first time. Method: For achieving good separation, a mobile phase of toluene: ethyl acetate: formic acid (7:3:0.5, v/v/v) was used. The densitometric determination was carried out at 366 nm in reflection/absorption mode. The calibration curves were linear in the range of 100-600 ng per spot for caffeic acid and quercetin. Results: During the analysis methanolic fraction of Bauhinia tomentosa L. floral buds showed the pres¬ence of caffeic acid (0.02%) and quercetin (0.018%). Conclusion: The proposed method is simple, precise, specific, accurate, less time consuming and cost effective. The statistical analysis of data obtained proves that the method is reproducible and selective and can be used for routine analysis of reported phenolic compounds in crude drug and extracts. The simultaneous quan¬tification of these compounds has not yet been reported in floral buds of Bauhinia tomentosa which may be utilized for the proper standardization of the plant. A. HPTLC Chromatogram showing peaks of sample and standards 1. Gupta A, Dwivedi H, Rawat AK. 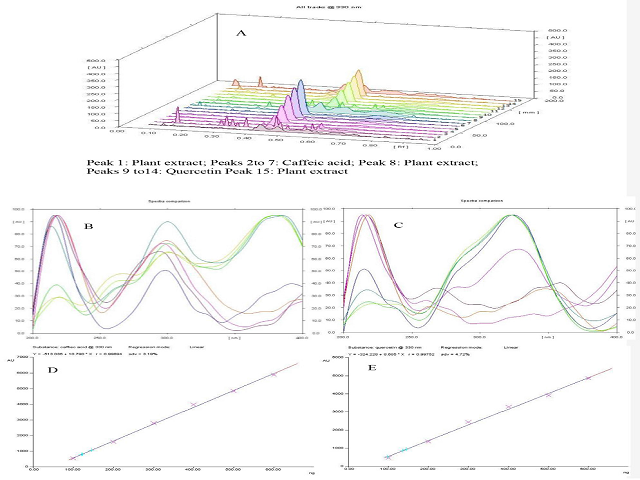 High Performance Thin Layer Chromatographic Analysis for the Simultaneous Quantification of Two Polyphenolic Biomarkers in Methanolic Fraction of Bauhinia tomentosa L. Floral Buds. Pharmacognosy Journal. 2018;10(4):773-777.